On second look, they appear to be leek seedlings. Now, life would be wonderful if my seed packet had said “days to emergence: 7 to 365” as I’d have had something to expect. But it did not. In other words, the seeds sprouted when their situation was ideal for them, not for me. And that’s the lesson we all can take with us. You see I think we’ve all internalized the notion that what is ideal for tomatoes (the fruity veg most likely to be started from seed) is what everything else expects too. And that is true in a way (warm soil, enough water, enough light) but it’s not absolute, it’s relative. Indeed, onion seeds sprout at much lower temperatures. Lettuces, carrots, and a whole passel of other things do too. 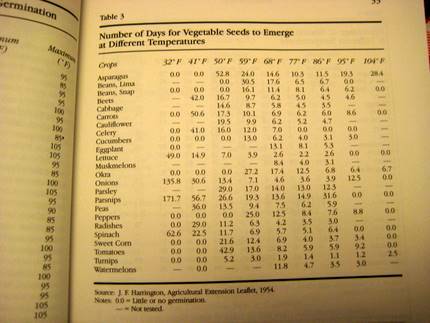 I keep referring back to the sprouting table in Nancy Bubel’s Seed-Starters Handbook for a reason, I guess. There’s a whole lot of truth in it that we need to understand. Otherwise, the knowledge gets handed to you in the form of seedlings you expected to arrive a year ago, or, well, not at all! I started some Opalka, an heirloom paste variety tomato. About 3/4 of the seed emerged on seed packet schedule. These plants got pricked out into individual pots and are looking very fine indeed and are about 4-5″ tall with as many leaf branchings. Meanwhile, back in the flat, a dozen “late-bloomers” germinated about 3 weeks later. Not only were they slow to germinate, but are just inching along toward those first true leaves. My thought as these are OP heirlooms, these tardy plantlings will demonstrate recessive gene patterns. Part of me says to tonot waste my time on them, the scientist in me says to give them a chance and see where they go. Hi El! Speaking of seeds sprouting (but not exactly seed-starting), have your peas sprouted yet outside? I just poked around in my pea-pots (live in the city suburb so it’s hard to find good dirt and sun in the backyard of my complex) and pulled one up to check, and it’s started to sprout (woohoo!) but they haven’t poked up out of the soil yet. I was worried that they’d rotted because of the warm then freezing-cold weather. How are yours doing? I decided at around eleven o’clock last night that maybe the seed mat wasn’t working so I brought it and the tomato, pepper, and eggplant seeds into the house and put everything on a folded up dog towel in front of a big, south-facing sliding glass door. When I stuck the probe into the six pack last night, the soil was around fifty degrees, but now it’s nearly seventy-one, so the mat is working (I can feel it). I can’t imagine what went wrong out in the garage. Last year I started the seeds up in mid-February, which was too early, so this year I started them in mid-March. I sure hope they come up- the packet of Amish paste from Bake Creek didn’t have a whole lot of seeds in it…..
Has anyone else noticed that Nancy Bubel’s guide has never been eclipsed? My first copy was the paperback second edition, and I am now perusing the hardback first addition, acquired after my Mom passed last year. The paperback edition is still the standard tome for seed starting after however umpteen years: although it doesn’t mention that it might take 365 days for your onion seeds to germinate, it does list 135 days as normal for 32 degrees F. Indicates to me that we don’t know all of Mother’s (Mother Nature’s) secrets yet! One of my favorite surprises is when ‘volunteer’ plants appear in the soil I’ve recycled from other seed-starting endeavors and used for brand new germination purposes. Just another reminder of how little control we actually have! Leeks are better late than never! Twice (so far!) this spring I’ve replanted or purchased fresh seed only to have the ones I’ve given up on sprout the next day. Oh well! I’ll just call it consecutive planting! Control is definitely an illusion. Outside the garden, I’ve taken to just chucking seeds around in areas where I’d be happy if they took and then moving on. It’s part of my Zen landscaping method. Sooner or later it’ll all fill in with things I like. Hi Rachelle. Interesting. I’d be curious, too: perhaps being slow to start can be a good thing. I am not 100% sure if this can be blamed on their being heirlooms, though. My experience with one aw-shucks seed company was they sent me two different varieties in the same seed packet; that explained to me the difference in germination and growth…but it took me until they fruited to really realize their mistake. I was mad, actually. Hope that’s not your experience. Paula, even my inattention to the seeds have shown me that indeed things are slow-going here too. Maybe they’re all trying to tell us something, like, dang, start me in April! I don’t know! But hopefully things are coming up for you soon. Mike, yeah. Every year I miss one window or another. Like, crap! the okra! or something. Maybe they’ll come up for you next year…just put them somewhere they’ll get chilled. Carolyn, well, I am sorry about your mom, that’s surely not the best way to acquire books. But yeah my old edition is still the best, the best info., so I heartily agree. Love it. And I had to laugh because I recycle my seed-starting medium too, and praise the volunteers. 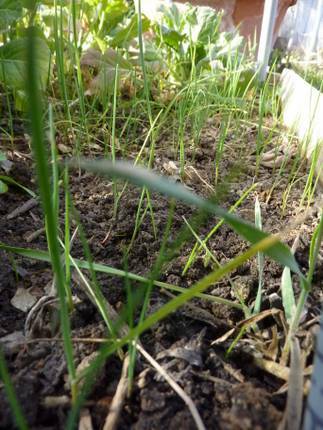 But: the compost is still my best source of surprise seedlings! Sissy, and yeah, it tells me that an unweeded bed can be a good thing so it’s rewarding my sloth! Sara, indeed. I have a 2nd round of peppers going. I’m about to give up entirely. Peter, that surprises me. I guess I saw you as more controlled, much less a live and let live kind of guy. But, well, if you can remember what you planted where, it can definitely work for you. Especially if you have lots of seeds. Yes, you’re absolutely right about watched pots…sigh. I gave up a few days ago, and today two sprouts are up! That’s not much, but I’m hoping the rest will follow soon. So looking forward to when I move to an apartment with a backyard where I can put raised beds and fences…I fear the resident groundhog will enjoy my peas before I do. Yay re your herbs, by the way!!! How exciting. An oregano patch is returning in my backyard, and I accidentally step on it (ooch sorry oregano) when poking around in my pots – it smells wonderful.